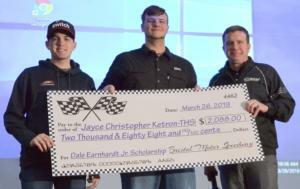 Bristol Motor Speedway officials, along with assistance from JR Motorsports driver Noah Gragson, surprised Tennessee High senior Jayce Ketron on Tuesday morning during a student assembly at the school when they notified the senior automotive student that he was the 2019 winner of the Dale Earnhardt Jr. Scholarship. The Dale Jr. Scholarship, created in 2017 in honor of the retired NASCAR driver who famously declared "It's Bristol, baby!" after winning the 2004 Night Race at BMS, is an annual award of $2,088 that is given by BMS to an eligible student in Sullivan County to continue his or her education in an automotive field of study. "I'm totally in shock," Ketron said. "I've been thinking about this and talking with my friends about it ever since I applied for it. It's unreal. I can't believe I won." Ketron is the second consecutive winner from Tennessee High. Jaicee Weaver won the inaugural Dale Jr. Scholarship in 2018 and she was also surprised when presented the award by Dale Jr. at his shop in Mooresville, N.C.
BMS executive vice president and general manager Jerry Caldwell along with Gragson, who drives the No. 9 Chevy Camaro for Earnhardt's three-car NASCAR Xfinity Series team, presented Ketron with an oversize check in front of a large group of students gathered in Tennessee High's Frank Winston auditorium. When Ketron's name was announced the students cheered loudly. Ketron's parents, Chris and Mary, also were in attendance as was last year's winner, Weaver. "We are thrilled to honor Dale Jr.'s legacy in East Tennessee by awarding this scholarship to a deserving local high school student," Caldwell said. "We had a number of worthy applicants, but Jayce's essay rose to the top. We think his passion and determination is what this award is all about." Ketron plans to attend the Tennessee College of Applied Technology in Elizabethton and hopes to one day open his own automotive service shop. He said it was a thrill to have a NASCAR driver present the check to him. "It's absolutely insane to have Noah present this check to me," Ketron said. "I am looking forward to putting this scholarship money to good use and pursue a career in the automotive industry." Gragson, who was hired by Earnhardt's team during the off-season after he had a strong 2018 season in the NASCAR Gander Outdoor Truck Series driving the No. 18 truck for Kyle Busch Motorsports, says he was honored and humbled to be able to stand in for his boss at the presentation. "To be here on behalf of Dale and help give Jayce an opportunity to get on the career path he wants to purse is great," said Gragson, who will drive in the Alsco 300 on Saturday, April 6 at BMS and hopes to be one of the four drivers in the race who are eligible to win the $100,000 Xfinity Dash 4 Cash bonus that will be up for grabs. "It's special because I know what it means to have someone help you get going in your career and give you a shot like JR Motorsports has done with me." Next weekend, NASCAR fans will have their first chance to witness short track racing at its best and watch stars like Chase Elliott, Martin Truex Jr., Kevin Harvick, defending champion Joey Logano, Kyle Busch, Brad Keselowski, Jimmie Johnson and Ryan Blaney will all be looking to take home the Gladiator sword from The Last Great Colosseum during the April 5-7 Food City 500 weekend.